Your spine is made up of bones called vertebrae, each of which is cushioned by soft discs composed of an outer layer of tough cartilage that surrounds softer, jellylike cartilage in the center. These discs are what enable you to move your spine around and bend over. If you’re feeling a sharp pain in the spine that radiates in your lower back, you may be suffering from either a herniated disc or a bulging disc. If you research your symptoms, you might be confused; that’s because people often use the terms herniated and bulging disc interchangeably. Despite this, there is a difference between a herniated disc and a bulging disc and understanding that difference can provide better insight into the reason for your pain. Here’s what you need to know. Over time, discs can show signs of wear and tear. They dehydrate and their cartilage stiffens, leaving them susceptible to injury. Herniated disks are also called ruptured disks or slipped disks, even though the disc neither slips nor ruptures. Herniated discs occur when the tough outer layer of cartilage starts to develop tiny cracks, through which some of the softer inner cartilage may protrude. Oftentimes, the herniated disc irritates the nerves that surround it; this is what causes severe back pain. Bulging discs occur when pressure from the spine causes the disc to bulge outward. A bulging disc may cause little or no discomfort, whereas a herniated disc is more likely to be painful because it usually protrudes farther and typically irritates nerve roots. Either the nerve is compressed, or the herniation causes inflammation of the nerve root. 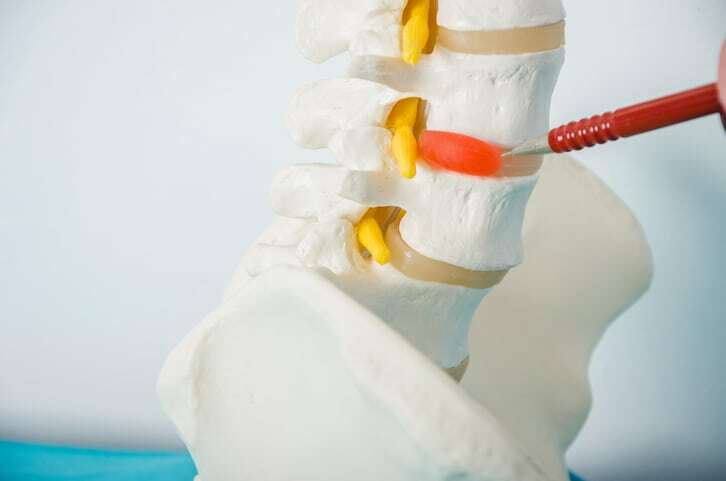 Since they are most often caused by the natural deterioration of the spine that comes with age, both a herniated disc and a bulging disc are considered degenerative spine conditions. Typically, the damage starts slowly with the development of a bulging disc. If left untreated, however, a herniated disc may occur. Damaged discs in the spine are often treated with conservative methods, such as pain medication and physical therapy. But if these measures fail to improve symptoms, spinal procedure may be required. At Personalized Orthopedics of the Palm Beaches, we offer minimally invasive spine surgery as an alternative to traditional open spine surgery. Our procedures can treat common spine conditions such as herniated and bulging discs. To find out if you are a candidate for our minimally invasive spine procedure, call 561-733-5888 today to make an appointment with Dr. Michael Baskin.